What can I do when I get disconnected? If you get disconnected during an event, you should try refreshing your browser window to regain connection. If the problem persist, please visit our check page and our support page. What type of connection should I use? To best experience VoiceBoxer we recommend using an Ethernet cable connection. To learn more, you can visit our blog post. You can always check your connection at our check page, visit how here. How do I upload my slides? 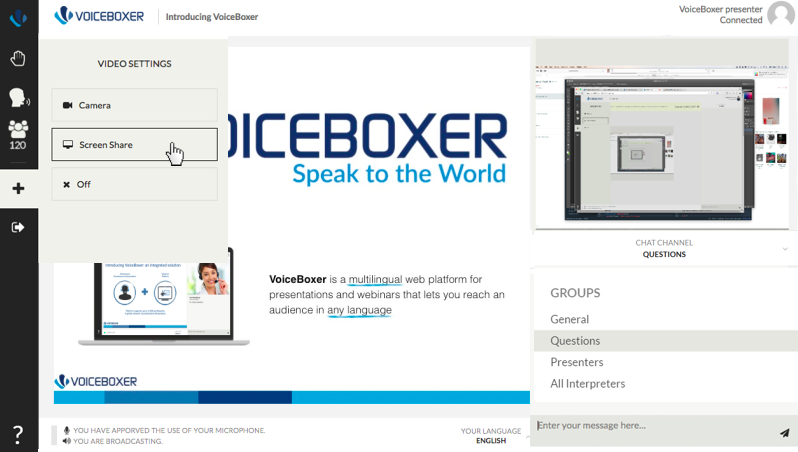 You can upload a presentation when creating or editing your event in the VoiceBoxer portal. How do I make my event multilingual? On a free plan you can create as many monolingual events as you wish. If you want to host a multilingual event on VoiceBoxer, please get in touch with us at contact@voiceboxer.com. Can I edit my event? If you need to edit the event details prior to its start, you can click on “Edit” button on the VoiceBoxer portal. Why do I need to choose a primary language for slides? When you upload multilingual slides to an event, you will have to choose a Primary language. The Primary language is the fall back language in case no slides are uploaded for all languages. Here’s an example. An event will be broadcasted in 3 languages: English, Spanish and French. If you upload slides only in English and Spanish and a participant listens to the event in French, the Primary language selection triggers which slides will be displayed. How do I convert my slides into images? If you create your slides in Power Point or PDF, you can save your presentation as images. For step-by-step guide click here. How can I view the video in full-screen format ? To enter video full-screen mode, hover the mouse over the video and click on the magnifying glass icon. Can there be multiple moderators? No. There could be only person moderating a session. Can audience intervene with voice or video? No. The audience can interact with the presenters and other audience members by using the chat. Screen Share requires the VoiceBoxer Screen Sharing extension, which is available for Google Chrome. Now you can click on Screen Share and share your screen with the other participants,. Depending on your role during an event on VoiceBoxer (i.e. moderator, presenter, interpreter, audience) you have different possibilities regarding the choice of browser. For the best experience, we suggest using Chrome, Firefox or Opera as browsers. Microsoft Edge is also among the supported browsers, however video streaming is not available when using it, only audio. How can I test my audio and video? Before any event where you participate as presenter or interpreter, we suggest you testing your audio and video settings. You can do that on our check page. To learn about the check page, visit this page. Will I be heard and seen during the whole event? No, the way VoiceBoxer is configured is that only one active speaker speaks at a time. This way, interpreters will only receive one audio feed at a time and will be able to perform at the best of their abilities! Only when the moderator gives you the floor, you will be heard and seen by the people participating in the event. To learn more about the roles visit this page. How long after a webinar will the recording be available? The recording is available approximately half an hour after the event has ended. Longer events may take additional time to be processed. All sessions on VoiceBoxer are automatically recorded. What is it included in my free plan? Under a free plan you can create as many monolingual events as you wish to try out VoiceBoxer with the limitation of having up to 10 attendees . To upgrade to a larger plan or to have your multilingual event, please contact us at contact@voiceboxer.com.